This note has been written following the conclusion of the seminar on “Security in East Asia from North Korea Proliferation Strategy to Maritime Security and Global Stability under the New Situation”, organized at FRS on December 5, 2017. In 2016, the election of Donald Trump surprised the world and reinforced the uncertainties in Asia, a region characterized by a paradox, where a remarkable economic dynamism contrasts with increasing tensions, from the China seas to the Korean peninsula, from the Sino-Indian border to the Taiwan Strait.Asia accounts for 60% of global growth. The GDP of the region as a whole represents 34% of the world GDP, that of the United States 24%, and that of the European Union 21%.The first regional economic power, China, is also a significant source of concern and instability in the region. In this context, the unpredictability of the American President raised questions among US allies. However, Washington remains the most decisive actor in the region, and, despite clumsiness and misunderstanding, Washington’s Asian strategy seems to be one of the positive achievements of the first months from the Trump Administration. 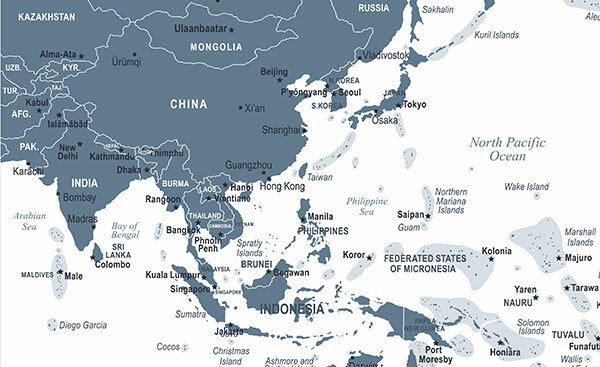 One of the first strategic issues in Asia remains the territorial disputes in the South and the East China Sea. The economic dimension is vital and makes any incident in these regions potential fuses for a global crisis. More than 5000 billion US dollars in trade go through these channels every year. In the region, China, the world's first trade power is at the heart of economic globalization far beyond its region, as well as the third, Japan. Moreover, 80% of the oil supply of all regional powers, including South Korea, passes through these seas. Tensions in these two areas, particularly in the East China Sea facing Japan, were less severe in 2017. However, the Chinese strategy of a progressive assertion of power has not stopped. Moreover, the question of the definition of universally accepted norms and international rules are also at stake. In spite of the decision of the Den Hague permanent arbitration Tribunal in 2016, which refuted all Chinese assertions on the South China Sea, Beijing did not give up its claims based on the vague concept of “historical rights” and a 9 dashes line, made public after the war by the then Nationalist government of the Republic of China, that extends from Hainan to the limits of Indonesia exclusive economic zone (EEZ). In 2017, Beijing did not take over new features, but continued to consolidate and increase the superficies of the features it occupies in the Spratlys and the Paracels as well as consolidate their militarization by building radars and airfields. No code of conduct has been signed between China and the countries concerned to alleviate the risks of conflict.Claimants are Brunei, Malaysia, the People's Republic of China, the Philippines, Taiwan, and Vietnam.The principle of a Code of Conduct for the South China Sea was laid down in 2002. In November 2017, negotiations resumed, but no document recommending the resolution of conflicts without the use of force and the absence of a change of status quo by any parties was signed between China and the ASEAN countries. China challenges Japan's sovereignty over the Senkaku archipelago, administered by Tokyo since 1895. In 2017, the situation has been described as “new normal.” It follows a period of acute crisis since 2012 when Beijing chose to take pretext of the purchase of some islands previously in private hands by the Japanese government, to increase its pressure and incursions near and in Japanese territorial waters.The objective was to deny access to Chinese vessels, but also to Japanese activists to stabilize the situation. The “new normality” means that China has pursued at a less intensive pace its incursions into the contiguous and sometimes territorial waters of the Senkaku, either with fleets of fishing boats, sometimes composed of several hundred ships, armed cost-guard vessels and, more rarely, Chinese Navy. These incursions occur at a regular pace and are systematically repelled by the Japanese coastguards. This, however, involves considerable mobilization of resources, including air patrols to monitor the dividing line between China and Japan EEZ, also disputed by Beijing, which exploits gas resources straddling the two zones. However, despite this reduction of tensions in 2017, the question is not settled. Indeed, territorial issues are not the cause, but the manifestation of an increasingly assertive posture on the part of Beijing regarding its neighbors. Also, the choice of the maritime theater sea is an essential part of this strategy. More than access to resources (apart from fishing that had become a significant issue for the countries in the region) activities at sea are also a way for China to try to demonstrate that it has become a real power, in contrast with the traditional image of a continental power, poorly equipped for global supremacy. As a consequence, China will not give up its claims in the China Sea, whatever their legitimacy. On the other hand, it can increase or decrease the pressures according to its interests. In 2013, China had declared an ADIZ (Air defense Identification Zone) covering all of the East China Sea, including some islets claimed by South Korea. However, despite repeated threats, it did not do so in the South China Sea. In December 2017, following meetings between Prime Minister Abe and President Xi Jinping on the sidelines of the APEC and ASEAN summits, a crisis management mechanism was put in place between Beijing and Tokyo to manage risks of incidents at sea. This is a gesture of goodwill, at a time when China probably needs Tokyo in the face of the United States, and as a potential investor in its Belt and Road Initiative (BRI), but should in no way be interpreted as a solution of the conflict or long-term appeasement. Once again, the key lies exclusively in the calculation of its interests that the Chinese government is always making. The second area of tension, which occupied much of the news in 2017-2018, is apparently the nuclear and ballistic crisis on the Korean peninsula. The first North Korean nuclear test took place in 2006. Pyongyang tested seven times demonstrating, an increasing capability. The last took place in September 2017, claimed as a hydrogen nuclear device with a power of a hundred kt. According to experts, North Korea may now have 20 nuclear weapons, and some sources consider that the miniaturization of these weapons has been mastered. As significantly, North Korea has also demonstrated a significant increase in ballistic capabilities. Under the new leadership of Kim Jong-Un since 2012, tests have multiplied, the last two confirming that - at least in theory - North Korea can now hit the United States with a potentially nuclear weapon. The threat is real, but it is not new. Japan and South Korea have been within range of North Korean short and middle range ballistic missiles strikes for years. During the last nuclear standoff, North Korea made direct threats against Japan, where 39,000 US troops are stationed.25 000 US troops are also stationed in South Korea. Also, Seoul is under direct threat of North Korea conventional artillery. Moreover, beyond the regional and US context, the North Korean threat is also global. Regarding targeting, Europe, and therefore France, are, like North America, within striking range, which requires the French deterrence to take into account this new capacity whatever the declaratory policy of the North Korean leadership. More stringent sanctions have been put in place, voted unanimously by the UN Security Council. However, the implementation of these sanctions has been problematic, despite a tightening of Chinese positions. The problem comes, among other things, from the massive corruption that characterizes the two regimes in the PRC and the DPRK, particularly at the local border level, that facilitates bypassing of controls, with China but also, to a lesser extent, with Russia. However, tensions have diminished considerably between the two Koreas since the beginning of 2018. Moreover, there was a dramatic reversal, with the meeting scheduled for May this year between the US president and the North Korean leader. In his New Year's speech, after years of continuous provocations, with the acceleration of nuclear and ballistic tests, the North Korean leader launched a charm offensive that took advantage of a favorable situation, with the organization of the Olympic Games in South Korea in Pyeongchang, and the election a few months before, of a new President, Moon Jae-in, more in favor of appeasement and a balance between pressures and negotiations. At the Olympics, Kim Jong-un's carried an invitation to a summit meeting in April, and a South Korean delegation was received in Pyongyang, where they met Kim Jong-Un. In return the North Korean leader apparently gave proposed to meet the American president, explicitly mentioning the possibility of “denuclearization.” According to the report of the South Korean delegation in Washington a few days later, Kim Jong-un also stated that he “understood” the resumption, of regular military maneuvers between the United States and South Korea in the framework of the military alliance that exists since the end of the Korean War. Caution is essential, one cannot rule out a tactical maneuver aimed at lowering the tension in the peninsula and averting the risk of US intervention, and at lifting the sanctions that no doubt weigh heavily on the regime’s capacity to meet the expectations of the ruling elite who support it in return for privileges that include access to the opportunity of doing lucrative business with the outside world. The North Korean nuclear program was incorporated in the constitution in 2012, and the consensus among experts was that the regime could not give it up. After the ICBM's latest trial, the North Korean leader declared that North Korea had completed its nuclear forces, presented as exclusively defensive to deter any risk of “regime change” by force or nuclear blackmail. However, the threat of regime change from the United States has been denied by Washington on many occasions. Moreover, the United States, since the early 1990s and the agreed framework of 1994, have repeatedly accepted negotiations with North Korea, broken because contrary to its commitments, Pyongyang had continued its nuclear program of reprocessing and enrichment before, gaining time before withdrawing from the nuclear non-proliferation treaty in 2003. It seems, however, with all the necessary caution that there has been an evolution and Pyongyang might consider that, after having proven to its people its technical capabilities, it might accept without significant political risk to mention the possibility of denuclearization. Notably because, despite the progress made, North Korea does not have a real deterrent capacity vis-à-vis the United States. The use or of a nuclear weapon would sign immediately the end of the North Korean regime; the capabilities are indeed much too asymmetrical for a strategic balance to be established. The only reverse case would be to imagine that North Korea could be protected by the Chinese “nuclear umbrella.” However, one can hardly imagine Beijing taking the risk of a potential nuclear standoff with Washington to protect its North Korean ally. In that context, North Korea might be more interested in breaking a stalemate, and perhaps save time, an evolution that should be credited to a strategy of maximum pressure implemented by the new US administration. However, a lack of consistency such as the early lifting of sanctions and pressure could have damaging consequences. Indeed, to accept the nuclear status of North Korea and resume negotiations on this basis would pose - besides the direct threat – several difficult questions. Despite the power asymmetry, it could embolden the North Korean leader, to reinforce his legitimacy, to try to impose a reunification of the peninsula on his terms, under the pressure of nuclear blackmail. Washington allies in the region may find impossible without a credible independent deterrent to live with a nuclear-armed North Korea. Also, the risks to the non- proliferation regime and the future of negotiations with Iran would also be affected. China's stance on these issues has long remained ambiguous, even though Beijing has voted for UN sanctions and seems to be applying them more strictly. Until the most recent developments, the main fear of the PRC leadership came not from the North Korean nuclear threat but its consequences, including the US focus on an area of direct interest to Beijing, and even a risk of a conflict at its borders after Donald Trump repeated threats of a preemptive strike if North Korea decided to directly threaten the US territory in Guam or its allies, including Japan. That said, it is not sure that Beijing is ready to abandon North Korea as a buffer state in the peninsula despite difficult relations with its leader. Since the implementation of sanctions following the first nuclear test in 2006, China has become North Korea largest trading partner. Also, while Beijing has been marginalized with the announcement of the meetings between the two Koreas and between North Korea and the United States, we can expect the PRC to try and regain some level of control. Indeed, China has long been able to use its position in the management of the nuclear crisis in the Korean peninsula to strengthen its position on the international scene, and try to - unsuccessfully - impose the solution that would be most favorable to its strategic interests in the region, i.e. a resumption of negotiations on the basis of a “double freeze” of nuclear tests and of joint exercises between South Korea and the United States which would mark the beginning of the withdrawal of the United States from the Asia-Pacific zone, and a direct threat to the strategic trust between the United States and its allies in the region. Another hotbed of tension, which rekindled in 2017, is that of China and India. Since the Chinese offensive of 1962 against an ill-prepared India, territorial issues between the two countries, which cover vast territories, have never been resolved. Border incidents occur regularly despite negotiations and growing economic interdependence. However, as in other cases, these tensions also stem from a broader rivalry of ideological models and the refusal from India, as indeed from Japan, to accept a Sino-centric hierarchical regional order that Beijing wants to impose, as a demonstration of the strength of the regime. Territorial tensions between India and China lasted for almost four weeks in 2017 on the Doklam plateau where China had the ambition to build a road against the will of Bhutan, and trust has not been reestablished on the part of India. Moreover, the question of the presence of the Dalai Lama, who took refuge in India since 1959, is another irritant, despite the extreme caution of India on the subject. Beijing recently vehemently criticize the Dalai Lama's visit to Arunachal Pradesh. For its part, India is worried about China's increasing naval activities in the Indian Ocean, particularly with the installation (it is a first) of a Chinese logistics base in Djibouti. Finally, there are also tensions over Chinese projects of diversions of the tributaries of the Brahmaputra, which takes its source in Tibet, to increase the water supply of northern China plagued with chronic drought. Tension could also resurface in the Taiwan Strait. The Island is de facto independent since 1949, after the takeover by the communist party on the continent. Since the democratization of the 1980s, the emergence of a pro-independence movement represented by the Democratic Progressive Party (DPP). Ms. Tsai Ing-wen, former head of the DPP, elected as President of the Republic of China in 2017 has shown a remarkable moderation in favor of maintaining the current status quo. However, she refuses to endorse a joint communiqué issued in 1992 which recognizes the “one China” principle. Beijing rejects any possibility of independence. The PRC has long considered that the natural movement of History and interdependence of the two economies, could play in favor of an inevitable reunification on the long term. The evolution, however, seems to be the opposite. The formula “one country two systems” applied to Hong Kong since 1997 has shown its limits with increased control by the central government and the lack of democratization. On Taiwan, the PRC never renounced the possible use of force and “reunification” remains one of the first missions of the PLA. Since Tsai Ing-wen came to power, Beijing has therefore increased its pressure, with the organization of important maneuvers and exercises in the Taiwan Strait. At the 19th congress of the CCP in October 2017, the Taiwan issue was explicitly mentioned, and one wonders if Xi Jinping will not be tempted to speed up the process to complete the mission of reunification, an essential part of the “Chinese dream” of rejuvenation. In this hypothesis, the risks of a major crisis in the Taiwan Strait cannot be ruled out. The role of China is essential in the most significant crises that threaten stability in Asia and beyond. Moreover, this role is directly related to the internal evolution of the Chinese regime, the contradictions it faces and the solutions chosen to solve these contradictions. On the surface, the PRC and its President have demonstrated their strength. Xi Jinping has gradually taken the control of the highest instances of the Communist Party and plans to remove any limit to the extension of his power as leader of the party, the Central Military Commission and President of the Republic. A massive anti-corruption campaign has been an essential instrument of this strategy. In reality, things are, and the unity of the party is probably less unanimous. At the economic level, one of the first pillars of the legitimacy of the Communist Party and the regime for the population, the reductions of inequalities remain uncertain. China cannot rebalance its growth without accepting a stronger slowdown. The control of debt, which represents more than 250% of GDP weighs on future investments that have been at the heart of the PRC’s economic successes since the economic crisis of 2008. To the regime, the period of opportunity that should have led to the unstoppable emergence of the PRC as the first power in the world is reducing. China is the second largest world economy beyond the United States, but it remains at the 74th place in terms of GDP per capita. It, therefore, needs strong growth to ensure the satisfaction of the population, avoid the middle income gap and ensure the improvement of a still very primitive social system. In this challenging context, the first objective of the regime is its survival. In one of his first speeches in 2012, Xi Jinping denounced the fall of the USSR and those who failed to defend it. For the Chinese president, this objective of regime survival, determines its entire strategy, including external strategy. Indeed, rather than accepting reforms that might endanger the system, Beijing chose nationalism, with its double dimension of revenge on past humiliation, and assertion of power. What Xi Jinping calls the China dream of great rejuvenation of the Chinese Nation? The realization of this dream would be the return to a golden age when China was supposed to dominate the world “under the Heaven” (天下). The implementation of this objective is at the heart of China's external strategy, including the ambition to establish itself as an undisputed leader in its immediate environment. This ambition to return to a “golden age” when the Chinese Empire perceived itself as “benignly” ruling over Asia through the tributary system, also explains the references, to justify present actions to “historic rights” in contradiction with modern concepts of international relations. This ambition to assert power, to reinforce the prestige and legitimacy of the regime, also explains why China cannot fit into genuinely multilateral institutions. One example is that of the Code of Conduct for the South China Sea. After a declaration in 2002, the negotiations stalled between China and ASEAN. They resumed in 2017, but any result runs up against the will of Beijing to forbid any decision that would limit its concept of sovereignty in the South China Sea. The PRC cannot accept any compromise - especially on the Taiwan issue and territorial issues - which would be perceived as a sign of weakness. It is this context that also explains the fundamental rivalry with the United States which cannot solely be interpreted as a “traditional rivalry,” the Thucydides trap, between a rising power (China) and a declining power (the United States). The more fundamental reason lies in the fact that, despite their limitations, the United States and its commitment to Asia remain the first factor of balance to the Chinese power in the region. The PRC might not want - and does not have the capability - to assert its global dominance, but ambitions to gradually exclude the United States from the Asian theater, creating divisions with allies, using economic pressure, accelerating the buildup of the military and playing on asymmetric capabilities that could increase Washington's reluctance to intervene in a conflict involving China in the region. For Chinese strategists, the system of bilateral alliances built around the United States in Asia “inherited from the cold war” should be replaced, ideally, by a regional organization dominated by China, modeled on the Conference on International Cooperation in Asia (CICA), chaired by China since 2014, which includes countries close to Beijing along lines close to the positions defended by the Soviet Union for Europe during the cold war. The silk route projects (One Belt One Road, OBOR, or BRI) are the illustration of China’s strategy of influence in its environment and beyond. It allows China to reinforce its image of a great power, with the use of massive billion dollars figures for investment and the mobilization of the communist party's propaganda organization. The economic dimension is not absent from investment projects - that also translate into uncontrollable debts for the target countries - that a way for China to export its overcapacity in infrastructure building. However, there is also the desire to impose the image of China as a seductive counter-model, based on rapid growth and an authoritarian regime, more efficient than the Western or Japanese democratic liberal model. This dimension of assertion of power and successful counter-model, which can seduce countries “all over the world” also serves the image of the Communist Party, and therefore its legitimacy inside China. However, one must put the success of the BRI in perspective behind the triumphalist discourses: the Venezuelan model in Latin America is not particularly attractive, in Asia, Pakistan itself is worried about Beijing's determination to take direct control of major infrastructures such as the Dhiamer-Bahsha dam, initially integrated into the Sino-Pakistan economic corridor. In Sri Lanka, the issue of debt repayment has been raised with the 99-year lease granted to China on Hambantota port. The question of transparency and corruption also raises questions and can become issues in internal politics of recipient countries. In China itself, even if public work State or collective enterprises can benefit from these projects, the issue of security and financing has been raised, since the Chinese projects tend to attract the most isolated and most vulnerable countries, where poor governance and a bad history in debt repayment capacity, prohibits access to major international agencies such as the ADB or the World Bank. China is also developing its military capabilities. Announced in March 2018, the defense budget should reach more than 175 billion dollars after an increase of more than 8%, which puts it far ahead of the budgets of Japan (44 billions US dollars), India (53 billions US dollars) and even Russia (61 billions US dollars). As soon as he came to power in 2012 Xi Jinping declared that he wanted to build a “combat ready” PLA, better trained, less corrupt, more technical and efficient. The development of naval capabilities, the construction of a second aircraft carrier is the symbol of this effort. The real power of denial, however, remains in China's nuclear and ballistic capabilities that impose to any adversary to take into account the positions of Beijing. These capabilities are at the heart of China's strategy of “winning without fighting,” trying to forbid or delay any reactions against its interests or actions. Beyond military capabilities, China is also developing a multimodal strategy consisting of elements of legal warfare to challenge international rules and norms, including the freedom of navigation and overflight, trade war to exert pressure, as in the case of South Korea against the decision to deploy the THAAD missile defense system, of the Philippines in 2013 around the Scarborough Shoal incident or of Japan with the “rare Earth war” in 2012. The PRC also uses information warfare with the mobilization of its internal and external « publicity » (Propaganda) departments. The objective is to gradually impose the image of a China which, unavoidably, will prevail and to some extent has already imposed itself as the first power in the world. This more assertive Chinese strategy - despite the opportunities offered - is seen as more aggressive by most of Beijing's neighbors and beyond. The image of China has gone from a source of opportunity to a factor of tensions and destabilization and China is emerging as a global problem more than as a solution. Far from Asia, where the threat is more direct, the European Union is worried about Beijing's division strategies, with the introduction of the 16 + 1 format that include the countries of southern and eastern Europe plus China. In Africa, Chinese offensives does not always raise positive reactions from civil society. In Latin America, countries like Brazil realize that their very unbalanced growth depends entirely on Chinese imports of raw material. In Australia and New Zealand, denunciations against Beijing's strategy of influence on political institutions and universities are on the raise. Finally, in Central Asia and the Arctic, Russia is concerned about Beijing's ambitions, even if Moscow continues to defend the Russian-Chinese strategic partnership in a context of isolation and Western sanctions. For the countries in the region, and more particularly in Southeast Asia, the prospect of having to choose between China and the United States, or that of a conflict between Washington and Beijing is not positive. Despite these reticence, continued US engagement in the region is considered essential to maintain a balance of power with China, particularly in a context where there is no NATO-type regional security organization. This dimension of reinsurance, including the validity of the US nuclear umbrella in all circumstances, is particularly important for South Korea and Japan, which are direct targets of North Korea and which, in the case from Japan, are also subject to regular threats from China. The issue of reassurance is not new. President Obama partly satisfied his Asian partners with the pivot to Asia - at the cost of withdrawing from other theaters of operation like Iraq and Afghanistan and a refusal to directly engage in a conflict in Syria. However, the concrete implementation was considered too timid, especially in Tokyo. The election of Donald Trump has raised other concerns in the region. During the election campaign, the theme of America First and the denunciation of old alliances may have worried Seoul and Tokyo, asked to take responsibility for their own defense, including the development of a nuclear deterrent capability. The withdrawal of the TPP (Trans-pacific Partnership) also appeared as a very negative signal given to the region, where China was able to present itself as an alternative and champion of free trade and globalization. However, after the elections and contrary to the most pessimistic previsions, Washington’s Asian strategy has been rather positive. In Japan, Prime Minister Abe took the initiative to present the positions of Japan, and the importance of shared interests between Washington and Tokyo. The Defense and State Department have also helped to promote continuity despite a lag in nominations. Finally, Donald Trump's visit to Asia in November 2017, a sign of a strong US commitment in the region, the longest from a US President since 1991, was particularly well received in Tokyo. However, also in Vietnam and Seoul. The strategy of maximum pressure on North Korea, with increased sanctions, targeting of Chinese companies accused of not respecting these sanctions, and threats of preemptive strikes in the event of escalating threats from North Korea, has undoubtedly played a role in the appeasement - perhaps temporary - of tensions. In the South China Sea, the United States also resumed FONOP operations, and the Secretary of Defense James Mattis reasserted US support for Japan's posture in the East China Sea and on the Senkaku. At the multilateral level in Asia, the QUAD dialogue format brings together the United States, Japan, Australia and India, to try to strengthen their positions facing China and. The Indo-Pacific concept, which emphasizes the emergence of a new theater that also responds to China's offensives across the Pacific Ocean and the Indian Ocean, has the same objectives. The question remains, however, of the place of South-East Asia and of countries like France, which, in Europe, is the only one with direct interests and an effective presence in both oceans. More concretely, if Tokyo cannot consider - contrary to South Korea - the possibility of the acquisition of a nuclear deterrent, the efforts to strengthen missile defense and conventional deterrence capabilities are real. Japan has recently adopted a budget allowing it to analyze the possible development of a conventional preemptive missile strike capability in the event of an attack. Against China, Japan is also strengthening its observation capabilities, with new radar and air patrol stations. The first F35 multi role fighter of the 5th generation has been deployed in January 2018 and Japan ordered 42 aircrafts that will be produced in the US and by Japanese companies. In South Korea, President Moon Jae-in, despite his hope to renew a form of dialogue with North Korea, did not question the deployment of the THAAD missile defense system despite strong pressure from Beijing. As a consequence, the role of the United States, to maintain stability within a zone that remains essential for the growth of the entire global system but which, behind this prosperity, is crossed by currents of tension, remains vital. However, this preeminence of the United States, which can only increase with the strategic imbalance in Asia, does not prohibit expectations and cooperation with the European Union, particularly with member States that, like France, possess both direct interests in the Asia-Pacific region and preserve capabilities that allow real cooperation with the regional powers.Valérie Niquet, ed., "Evolutions des équilibres stratégiques en Asie-Pacifique : quelles conséquences pour nos intérêts, quelles réponses et quels partenaires ? ", Etudes FRS, 09-10-2017.The adoption of new regulations in Japan, widening the scope of cooperation in capacity buildings to sectors now makes it possible to set up collaboration mechanisms, particularly in South-East Asia and in the maritime domain. However, for the countries of the region, European perception of security issues in Asia and unity among member states, beyond France remain a concern. Some European countries, particularly the most fragile, targeted by Beijing's economic offensives, seem ready to accept the principle of an inevitable leadership of China, without being aware of the weaknesses that put this prospect into perspective. Paris, in fact, often appears isolated in its understanding of the global challenges posed by North Korea and - to a lesser degree - by the PRC, in respect with the universal democratic norms that are at the heart of the European project. Similarly, the Asian countries, including Japan, must also understand that if the European Union has accepted to participate to the amount of 0.2% to the Asia Infrastructure Investment bank (AIIB) launched by China to finance OBOR, it is essentially to try to know more and influence the rules of the institution in terms of governance and to control its orientations. In this context, any exclusion of the European powers that could play a positive role in the Asia-Pacific region, could have negative effects concerning perception and strategies in a context of budgetary constraints. Paris has an interest in the QUAD format that bring together the United States, Japan, Australia and India and also develops strategic dialogues in the region with Australia, Japan or India. The European Union, France, Japan, India, Australia and the United States must build trust, based on the perception of common challenges as well as the necessity to prepare to hedge against China's assertive strategy in a vast area extending from the Pacific to the Indian Ocean and work on a common agenda, between like-minded countries that also share a common vision of the fundamental values needed to stabilize the global system.